y Family Tree has many heroic men and women or I would not be here blogging today. It is only by standing on the shoulders of giants that I can see farther — Issac Newton borrowed that quote from a much earlier time; But it is still true today. In today’s article, my third of three ( Article1, Article2 ) on Haller’s Army and the heroic 25,000 men who volunteered from America to fight for Poland in World War I, by fighting in France’s army (and their blue uniforms). I do not know how many people have such in their Polish genealogy, but this strikes me as a large number for one family. What is interesting is that the story for each is so different. So armed with the Name and Location you should be able to tell if it is your ancestor or not without having to order the form(s). However, it is inexpensive enough that you can order multiple people when in doubt. Better yet, go to the Polish Museum of America in Chicago and then you can review the form in person before ordering. Boleslaw Wlecialowski registered in Hamtramck, MI. on his Form C, he mentions that his nearest relatives in Poland are Maciej and Katarzyna Wlecialowscy in the Gubernia of Kiecle, Gmina & Miasto of Pacanow. That is invaluable! Of the three forms, Form C is the most valuable because it asks for nearest relatives in both the US and in Poland. Form A has the basic info (name, address, etc.) and Form B (the medical form) is perhaps the least valuable form of the three. Form L is just the collection of all three forms. 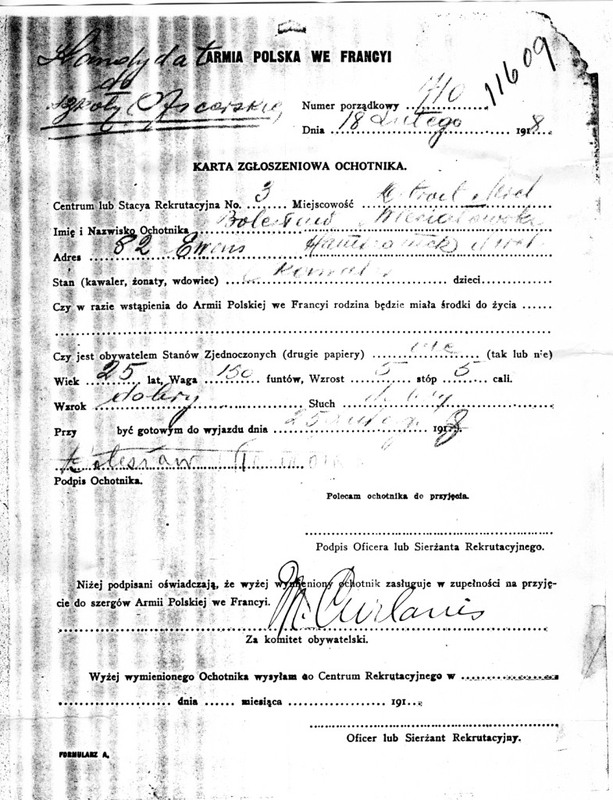 When Boleslaw returned his ship manifest on the SS Princess Matoika said he was returning to his sister Rozalia Gawlikowski in Detroit, MI. The above ship manifest is an image of the manifest header with lines 17-19 spliced in to show Boleslaw’s record on his return from Haller’s Army. He returned 21-July-1920 and his passage was paid for the by the US Government (on page 2 not shown). Now Wlodzimierz Kendzierski (aka Kędzierski) is interesting on two accounts. First he registered twice. Once in Detroit and once in Pittsburgh! Now that was helpful because he listed different contacts in the US in the two documents. It was also interesting because I could not find his returning ship manifest (although I did find his brother Ludwik return — but who had not registered?). Genealogical mysteries! Now we know he served because we have a picture of Wlodzimierz in his Haller’s Army uniform. So he definitely served. I suspect the Ludwik Kedzierski returning (August 1922) to his cousin in Pittsburgh was really Wlodz. But this is interesting. Perhaps the two registrations are because one registration office said ‘no’ to his volunteering and the second office said ‘yes’. Once again, it was invaluable that we ordered both sets of forms and both forms indicated he was the same person (naming a sister, brother, brother-in-law, and a wife with known addresses). Although Wlodzimierz is an uncommon first name and the complete combination is rare indeed. What it did do was show a family connection to the Pittsburgh Kedzierski which we did not previously know. Now the third family member was interesting in yet another way. Both Boleslaw (who became Bill) and Wlodzimierz (who became Walter) returned to US and lived full lives as Americans. 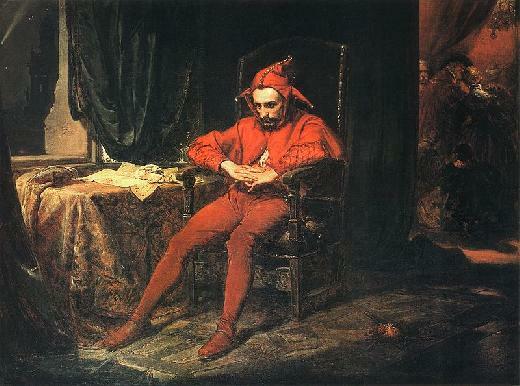 However, Pawel Elijasz was an enigma. I could never decide how he was related because I only had a ship manifest and a 1910 US Census from Depew, NY. So until I found his registering for Haller’s Army and finding out that he lived with a cousin of my grandfather’s who was Pawel’s brother I did not know how Pawel fit in. 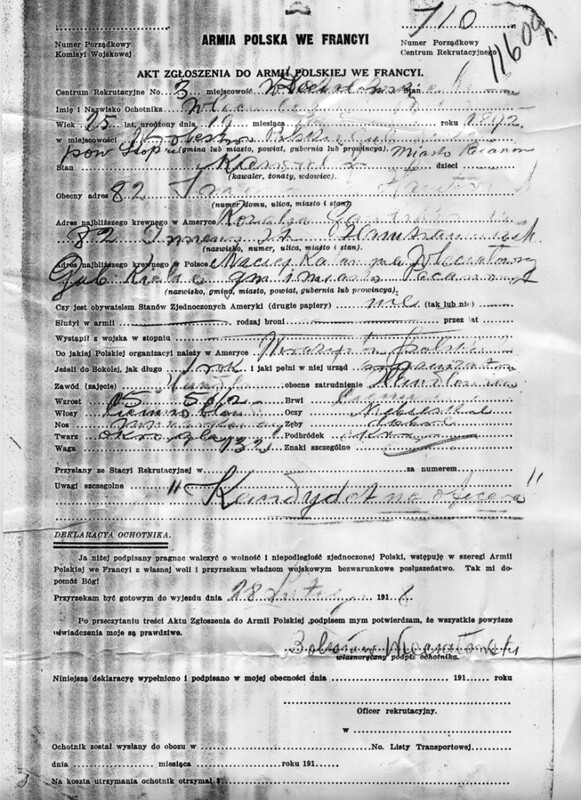 Then I found his birth record from Pacanow and his marriage record from Pacanow and the birth record of Pawel’s daughter and his being a God Father to a nephew all in Pacanow. So those church records which connected him with the Pawel in Haller’s Army and which connected him to the Eliasz/Elijasz in America answered many questions for me. Including what happened to Pawel after 1910. I now knew he registered in 1917 in Toledo, OH for Haller’s Army and that he lived with his brother Wincenty Elijasz at 1054 Campbell Street, Toledo, OH (down the road from my grandparents and next door to a married sister Wiktoria, Elijasz Mylek). So now I had a bit more timeline for Pawel. I just assumed he went back to Poland to live with his wife and daughter (and hence why no 1920 or 1930 US Census records). Imagine my shock when I found this last piece of data at a Polish Genealogical Society website. 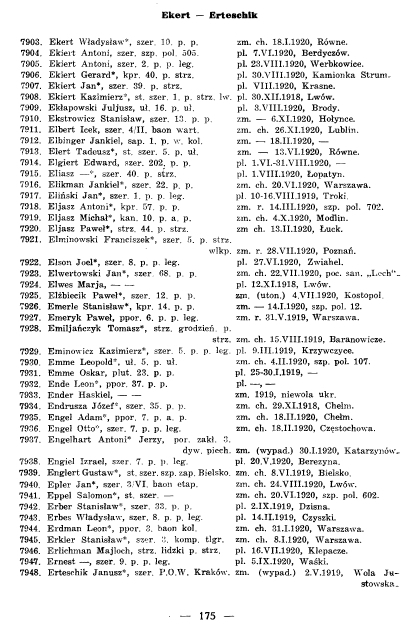 The link just preceding is to a database: “List of Casualties of the Polish Army, killed in action or died from wounds from the years 1918-1920” . I found out that Pawel had died, while serving in Haller’s Army ( 2/13/1920 in Łuck, Poland ) [see next image of a book page]. So now I knew the rest of Pawel’s story. But it was his Haller’s Army registration that answered so many questions and connected up church records in Poland with US Vital records. As an aside, finding out that Pawel was a brother of Wincenty and Wiktoria Elijasz and not a brother of my grandfather was still a great find. For Pawel’s sister Wiktoria is the only ELIASZ in the whole family tree with the following distinction. Wiktoria has Vital records in US/Poland with her last name spelled as: ELIASZ, ELIJASZ and HELIASZ. So now you know why the family tree acknowledges all three names as one family name. I have had ELIASZ and HELIASZ combos (modern and historical). I have had ELIASZ and ELIJASZ combos in my own family. But Wiktoria is unqiue in that she was the only ELIASZ who has used all three versions of the family name at one time or another in her life. Wiktoria is also God Mother to two of my uncles. Wiktoria is also related to the lovely Elzbieta Heliasz Kapusta who sent to me, my grandparent’s marriage records (both civil and church) from Poland where Elzbieta lives and who does not speak a single word of English. So it is a small world indeed. I do not have a Polish Consulate newspaper article saying any of my three ancestors earned land from Poland for their service. I also do not have any info from PAVA, but the next time I travel to NYC, I will look them up and see if Boleslaw or Wlodzimierz were ever PAVA members. I will try and find an example of the Polish Consulate messages to an American-Pole in a Polish Language US newspaper where they were seeking an Haller’s Army veteran now living in the USA and post it here for you my good readers to see. I hope this series of postings has motivated you the Polish Genealogist to seek out this unique Polish genealogical resource and then track down the other connecting pieces to this puzzle.